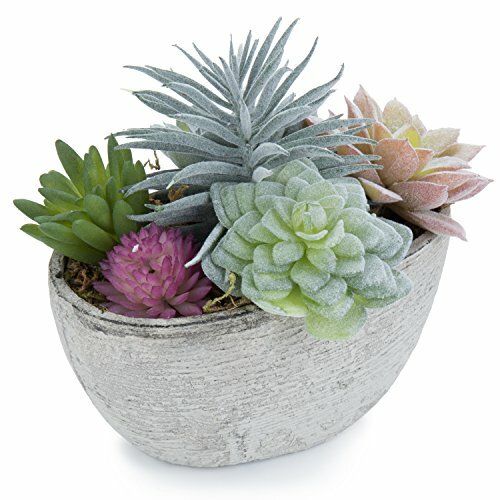 MyGift Assorted Artificial Succulent Plants in Rustic Textured Pulp Pot by MyGift at Home Decor Outlet Store. MPN: TB-DECO1102BEI. Hurry! Limited time offer. Offer valid only while supplies last. Arranged elegantly in faux moss soil, these artificial succulents create the perfect addition to any desktop, bookshelf, tabletop or outdoor space. Arranged elegantly in faux moss soil, these artificial succulents create the perfect addition to any desktop, bookshelf, tabletop or outdoor space. Nestled neatly into an oval, textured, cement-inspired planter, each unique life-like plant exudes a natural ambiance. Since these plants are fake, there is no watering, sunlight, or trimming required, allowing you to enjoy the fresh greenery all year long. SPECS: Overall - 5.7 H X 7.1 W X 5.1 D; Pot - 2.8 H X 5.7 W X 2.8 D (in inches). POTTED FAUX SUCCULENTS: A vibrant array of artificial desert plants inside a stone-inspired textured pulp planter. VARIETY OF PLANTS: 6 different types of succulents are perfectly potted in faux moss soil. DECORATIVE ARRANGEMENT: Ideal for livening up bookshelves, workspaces, tabletops or event spaces. LOW-MAINTENANCE: Faux plants require no watering, sunlight, or pruning, just the occasional dusting to keep them thriving and vibrant. View More In Artificial Shrubs & Topiaries.